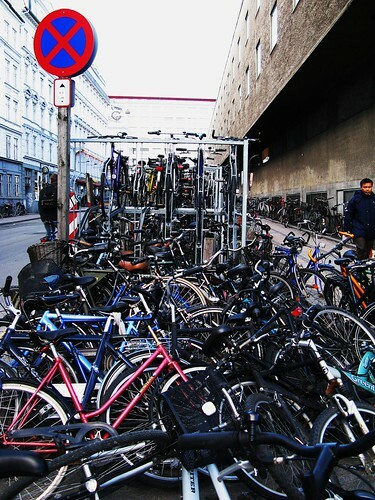 The Copenhagen Central Station has been the most massive bicycle magnet in the country for a century. The streets around the station are flooded with bicycles. Plans were revealed today for a new parking complex with room for... 7000 bicycles! behind the station. »Now more than ever there is a need for bike parking at the train stations and the problem won't get better with the coming Metro extension construction around the city", said Klaus Bondam - Mayor in charge of the Dept. of Transport. The idea is to widen the bridge behind the station - Tietgensbroen - so that it covers more of the railyard. The design for the new bicycle parking will be decided through an architecture competition that will start in the new year. The parking complex is expected to be finished in 2013. It will be financed by the City of Copenhagen, Danish State Railways and Banedanmark.